Wine drinkers like me have been banging on about English sparkling wine for ages now. Our arguments in favour of the bubbly stuff from the UK’s shores dragged on ad nauseum, although only recently has the drink gained wider attention. It’s won awards (although I find them largely irrelevant); it tastes much like Champagne (which is what we’re after anyway, right? ); it is generally just a great thing to drink. With the Royal Jubilee not far away and The Apprentice dedicating an entire hour to it, even though the best they could muster were some utterly cringe-worthy TV adverts that made the product look cheap, it seems everyone is talking about bubbly from Britannia. And don’t think the reasons for buying English wine are based purely upon patriotism (although I should mention I’m Canadian, not British, so you couldn’t accuse me of being patritioc here). This is not a case of me promoting it simply because it’s English while ignoring the fact it tastes of antifreeze. That might have been the case many, many years ago, but not now. It actually tastes very good. Really, it does. Unfortunately, you’ll pay a lot for it, too, because English fizz isn’t exactly cheap. 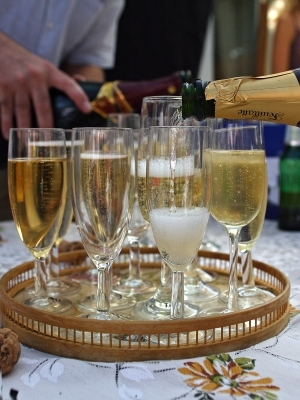 Quite often you’ll be paying Champagne prices, but more in the mid-range of £20 to £30. But there are a few bargains out there, so don’t despair. The other week I wrote about sparkling wines from France’s Limoux region and said they could bought for as little as £10. If you find an English sparkling wine at that price, you’re likely buying a pup, so watch out. Now, there are quite a few producers in the market so it’s important to know who makes the best stuff. Nyetimber is regarded as the best in the country, but you’ll pay more for their wine than most others. Lately it has had stiff competition form several other outfits. Camel Valley could very well be producing the current best sparkling wine in all of England. Same, too, for Ridgeview, which has an extensive range covering bargain bubbles all the way up to much higher-end fare. Bolney Wine Estate is also highly regarded. In fact, the Bolney Wine Estate Cuvee Rosé, which sells for £23.99, received top markets from Steven Spurrier. Other producers of note include Chapel Down, Plumpton College, Hush Heath Estate, Gusborne Estate, Breaky Bottom, Coates & Seely, Meopham Valley Vineyard and Denbies Wine Estate. Many of these wines can be bought from the Sparkling English Wine website and, overall, they all get good ratings. Where English sparkling wine perhaps falls down is the fact many wineries release their creations too soon. Many of the vintages for sale now are from within the past four years, which doesn’t give a wine like this time to mature and develop all those great flavours we find in vintage Champagne. The result is many wines have been criticised for not being quite mature enough to drink, having not developed the deeper flavours and aromas that come about after time in the cellar. While it would be ideal if the producers would hold back their stock for at least an extra year before releasing to the public, the economic reality of making wine means it’s often necessary to push stock out to retailers in order to keep revenues flowing. As a result, it is best to look for older vintages when possible. And if you have the appropriate space and the patience to go with it, storing the bottles for at least a year will doubtless make a difference. This is one of the most famous sparkling wine producers in the UK and therefore one to try if you want a classic. Brioche on the nose, nutty like Champagne, excellent fizz. This was a joy to drink at Christmas. As the entry-level wine in Ridgeview’s range, Bloomsbury is an absolute bargain but still provides all the hallmarks of great English sparkling wine. A little lighter in style than its more exensive cousin but not lacking in flavour: brioche, nuttiness, great bubbles. If you want a slightly more complete wine, try their Merret Grosvenor (which I happen to have in my cellar) for around £25 a bottle. Also available via Virgin Wines. If you fancy the pink stuff, this is probably the top sparkling rosé in England. It recently placed in second out of a heap of English sparklers rated by Steven Spurrier. Match it with goat’s cheese, olives, peaches or…perhaps a carbonara? Rated one of the best sparkling wines in the country, Camel Valley is produced in Cornwall, far away from the traditional English wine country of the South East. From the makers of Ridgeview, South Ridge is the Laithwaite’s own brand and represents one of the cheapest entry points into English fizz. For something more special, try the South Ridge Blanc de Noirs 2009 for £19.99 a bottle. This is an edited version of an article written for Ella Mag as part of my wine of the week series.